This is the first in an ongoing series saratoga living‘s doing, where we’ll be asking chefs from some of the top restaurants in the Capital Region to create us the ultimate “Saratoga Bite.” The best part? You can either ask them to make you this exclusive, off-menu item the next time you’re there—or simply make the bite for yourself at home. When deciding how to create my “Saratoga Bite,” I went the cozy, comfort-appetizer route. I wanted to create a small-plate dish that’s easy to share or keep all to yourself. These fritters aren’t on our menu but are something we can create with the mise en place* we have in the kitchen. 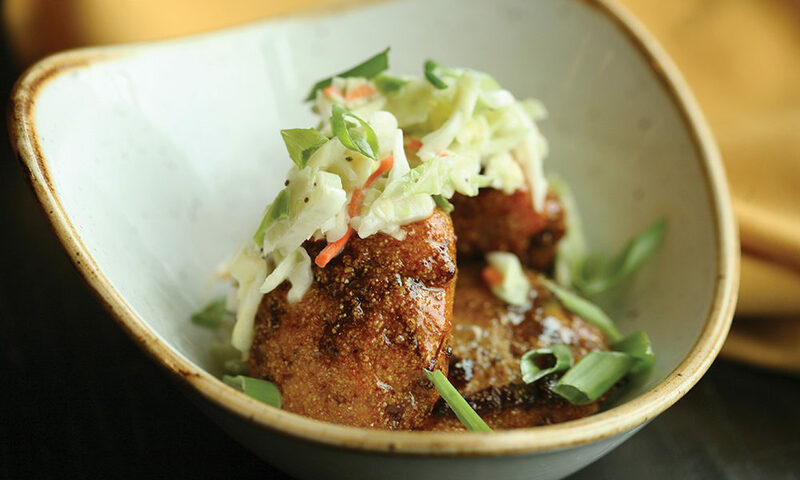 Next time you’re at Prime at Saratoga National, ask your server for the “Saratoga Bite” featured in saratoga living. Heat milk until it starts to simmer. Mix cornmeal, butter, egg, Old Bay, salt and sugar together, and whisk in warm milk until incorporated. Add braised pork to milk. Remove pork and form into 1-oz. disks. Deep (or pan) fry the disks until golden brown. Toss disks with half of honey mustard. Place disks in bowl and drizzle with remaining honey mustard. Top with coleslaw and serve. *As any Top Chef or Food Network aficionado surely knows, this is a French phrase referring to the process by which foods are prepared and organized prior to cooking.